Category Archives for "New Homes in Port St Lucie"
The floor plan of this St. Andrews Park Villa is called “Biltmore” and it features 2 bedrooms, 2 bathrooms, plus a den. See the photos below for inspiration on designing the interiors of your dream St. Andrews Park villa! For upgrades, additional charges may apply. Each villa in St. Andrews Park has lovely exteriors from beautifully manicured lots, brick pavers on the driveway and entry walk, and designer coach lights. You’ll also notice other distinctive exterior appointments such as the concrete tile roof and the two car garage with electric door openers. A unique feature to this model is the den. The standard design of this area is ceramic tile, but you can find out more about the home customization options by viewing our St. Andrews Park Villas floor plans page. It’s relatively easy to find beautiful single-story homes in and around Florida but finding one that fits your budget – that’s got to be tough. Fortunately, this St. Andrew Villa home for sale combines comfort, convenience, and an upscale design without the expensive price tag. This is the Ashley model in St. Andrews Park by St. Andrews Park Villas. It is a 3 bedroom 2 bath energy-efficient home with the total square footage of 2,635 sq ft, and 1,985 sq ft under air. This St. Andrew Villa home for sale also comes with its own laundry room, accessible from the kitchen, making it even more convenient to do everyday household chores. If you feel like heading out for some fresh air, why not relax at the covered porch? While viewing the backyard, perhaps this would be a good space for you grow your very own mini herb garden or maybe beautiful roses? The clubhouse amenities include a complete fitness center, a grand gathering room for all your party space needs, a game room, and a large pool with sundeck. Speaking of amenities, you will surely love what St. Andrews has to offer! 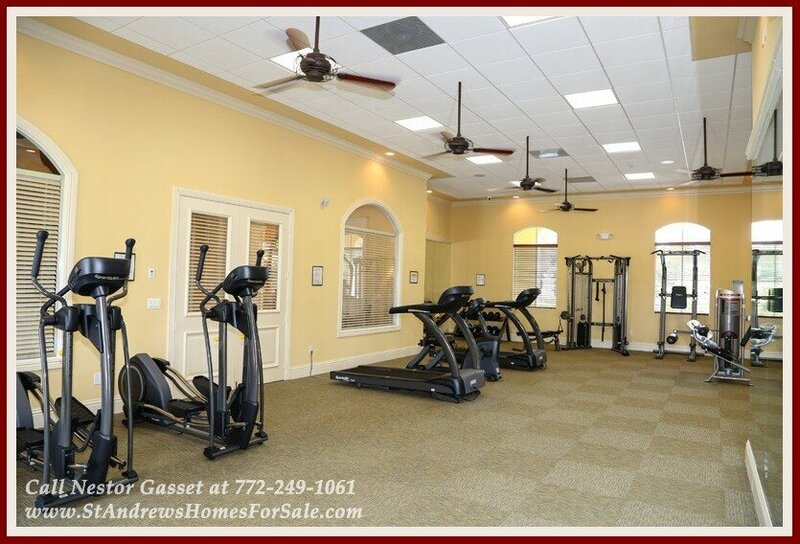 The community club house features a fitness center, a game room, and a large swimming pool! The clubhouse also has a grand gathering room that even has a partial kitchen perfect for get-togethers with neighbors and friends, and even celebrations. Located on a premium lot with a beautiful waterfront view, this home is one of the first homes that the developer will build in St. Andrews Park Villas! You can still select the interior finishes you want for this home! Disclaimer: The images below are of the model home “Chelsea” and are used for illustration purposes only. Introducing the St. Andrews Villa Homes’ Chelsea model, a 3 bedroom 2 bath energy-efficient home located in the vibrant city of Port St. Lucie FL. This home boasts of high ceilings and crown molding throughout, with R-30 fiberglass ceiling insulation that helps keep your home cool especially during the summer time. Would you prefer a 2 bedroom home instead? Check out this 2 bedroom St. Andrews Park Villas home with a canal view. The St. Andrews Villa Homes HOA fees cover basic homeowner’s insurance, community landscaping and irrigation, basic cable TV, internet access, street lighting, individual home lawn maintenance, maintenance of the homes’ exteriors, roof and exterior walls’ insurance, as well as full-access to the St. Andrews Park Community Clubhouse. The community clubhouse features a large swimming pool, a media room, a game room with a partial kitchen perfect for gatherings, and a complete fitness center.